This year we got to mass early (9 am) and even got a seat! We Skyped my family from home, then celebrated an outdoor Easter with friends at nearby Kapiolani Park. On the heels of last year's Big Fat Italian Easter, I was feeling inspired for classic Italian flavors. My contribution to the casual, BBQ style lunch were these caprese skewers with hard salami. Food on a stick is a no-brainer for outdoor occasions. The cherry tomatoes and basil were from our local Farmer's Market while the marinated mozzarella pearls and hard salami slices from Whole Foods. The classic combo of tomato + basil + mozzarella was made even better with the hard salami guest star! After the first hour the entire container was empty - success! Following my weekly trip to the Saturday morning Farmer's Market I shared the following photo on Facebook. That's 2 lemons (intuitive, right?!) 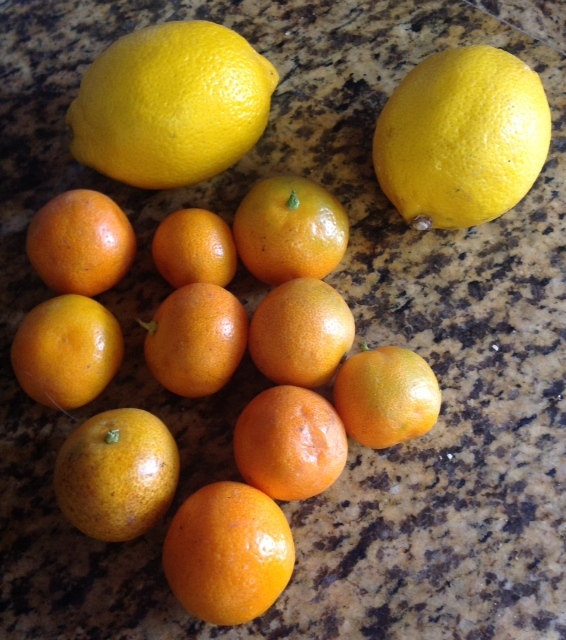 and 10 mini orange-colored limes! Just 10 for a dollar, too. Trying to keep with some type of Easter tradition we brought lamb for grilling. It was tender, juicy, and yummy but knowing that I paid almost $20 for these four little items prevented me from enjoying it too much! Damn you, Whole Foods. While we're on the subject of Whole Foods, they're the only place I've found on Oahu that has mini cannoli shells. They sell prepared cannoli of many different varieties and both regular sized and mini, and if I ask nicely enough the bakery manager will usually sell me just the shells :) Three days before Easter is not a good time to ask, unfortunately. I would have to make do with either serving 6 cannoli to 10+ people [yeah right] or get creative on how to successfully make a traveling cannoli [OK!]. Most times I get my great ideas in the shower, although this one came to me in the middle of the night: I'd make a deconstructed cannoli shell in miniature portions! In the food processor I combined 6 ice cream cones and 2 tablespoons of melted butter. In a mini muffin tin that was HEAVILY assaulted with non-stick spray I distributed the crumby mixture evenly and gently packed it with a spatula. They baked in the oven on 350 for just 10 minutes. After letting them cool I gently removed them from the pan and put them in 2 ounce condiment cups. You know, the ones for Jell-O shots! They were a bit more delicate than I would have liked and the sides became very crumbly with even the slightest touch so the plastic shield was great. I was so consumed with the shell/crust that I forgot to add the chocolate chips to our family recipe for cannoli filling. The filling traveled to the park in a piping bag and I topped each one with the delicious mixture just before we ate them. It was so much easier than filling a traditional cannoli shell! It is with great pleasure that I can say that everybody loved them! The most popular way to eat these adorable little traveling cannoli was to inhale the whole thing like a shot. That, of course, eliminated the crumbling of the crust and kept fingers mess free. The filling was sweet, creamy, and comforting, as always. The buttery, crumbly, crunchy crust was the perfect compliment and the size was perfect for a day of overindulging. Hardly any of our friends knew what they were eating, although they knew they liked it! When I told them the crust was made of ice cream cones they were shocked. I suppose it does look more like a graham cracker crust, which is another good idea! I'm quite proud of my mini cannoli creation and will attempt to make them again soon using the actual cannoli shells and the chocolate chips! HOLY CANNOLI is all I can say! I hope yinz enjoyed your Easter as much as we did. Hi Angie, sorry I didn't get a chance to Face Time with you on Sunday. I was busy with my own cannolis. I've used pre-made pie crust, cut them with a biscuit cutter, placed them in the bottom of muffin tins and bake. They make cute little shells. It's perfect for a little bite of cannoli although that means we just eat more! hahahahaha! No worries! The call was crazy, loud, and fun, as always. We were interruped by the guys wanting to talk cars with Bryce! Someone actually brought your cannoli shell in so we could see it :) More cannolis = more happiness! YUM! I love cannolis and this is such a fun spin on them! I will definitely have to try this recipe! Let's pair up and I'll make your cannoli cupcakes at the same time! Holy Cannoli. It was so nice to meet and share a bunk bed with you, I look forward to staying connected via blogs.